The opening months of 2017 are quite hectic for the space agency with five missions lined up for the first quarter. THIRUVANANTHAPURAM: It’s a new year bash of a different kind at the Indian Space Research Organisation (ISRO) this season. The opening months of 2017 are quite hectic for the space agency with five missions lined up for the first quarter. 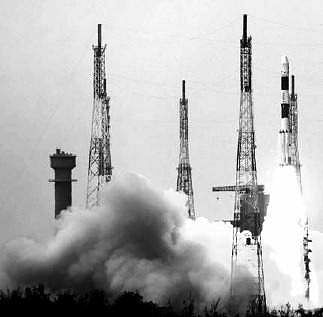 This include the first full-scale flight of the Geosynchronous Satellite Launch Vehicle Mk-III (GSLV Mk-III) and the keenly-awaited ‘Pad Abort Test’ in connection with the Human Space Flight Mission. There will be two missions of the Polar Satellite Launch Vehicle (PSLV), one launch of the Geosynchronous Satellite Launch Vehicle Mk-II (GSLV Mk-II), the first full-scale launch of the giant Geosynchronous Satellite Launch Vehicle Mk-III (GSLV Mk-III), in addition to the ‘Pad Abort Test,’ Dr K Sivan, director of the Vikram Sarabhai Space Centre (VSSC) at Thumba here, ISRO’s nodal agency for launch vehicles, said. All five missions are interesting in their own ways. Towards the end of January, the PSLV-C37 will lift off with a record 83 satellites, the biggest of which will be the 730 kg Cartosat 2D. The 83 will also include a bevy of miniature ‘cubesats’ belonging to Kazakhstan, Netherlands, US, Switzerland and Israel. The PSLV-C38 will lift off soon afterward with the Cartosat-2E satellite. While the PSLV flights are nowadays viewed as routine, the GSLV Mk-II mission will be viewed with special interest as it will carry the SAARC satellite - renamed the South Asia Satellite. ISRO chairman A S Kiran Kumar had announced in November that the mission will take place in March 2017. The first full-fledged launch of the GSLV Mk-III mission, with an upper stage powered by an India-make heavy thrust cryogenic engine, is expected to be conducted in March. ISRO is also trying to squeeze in the Pad Abort Test, which will demonstrate an escape mechanism for future astronauts in case a manned launch is aborted on the launch pad.